Alimentària will be held in Barcelona from 31st March till 4th April. The Governing Board will be there to represent the cellars that form the D.O. Ribeiro. Over the last few months, International Team Consulting first identified all those distributors of Spanish wines, both domestic and from overseas, who would be exhibiting at or visiting the Fair. We then contacted them one by one to inform them of the work carried out by the Board, the participating cellars, and then scheduled visits to wine tastings at the stand. 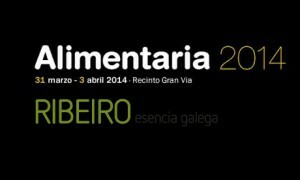 We have had a very positive response from a large number of firms, many of whom have indicated that they would be visiting the D.O.’s stand to learn more about the Galician wines, their quality and grapes varieties. Alimentària is the meeting point in Barcelona for Spanish, Catalan and international companies involved in the Food & Beverage Industries all of whom looking to open up new markets and explore opportunities for new business. International Team Consulting will ensure that your presence at a Fair will be a success. In addition to the purely administrative tasks of exhibiting, we will carry out all the work involved in the preparation including finding those clients of potential interest and ensuring that they effectively visit your stand, oversee promotional material and its use, and guarantee an effective post-fair follow-up.